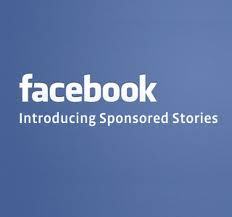 Recently Facebook started updating its advertising program by making changes to Sponsored Stories. 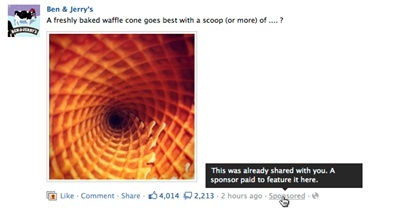 Sponsored stories first appeared in 2011 as a way to turn your friend’s actions and posts into promoted content for brands. For a breakdown of how these ads used to look, check out this Mashable post that does a great job of explaining it. Today, we’re going to talk about the most recent changes that Facebook will be making to these stories. Facebook Sponsored Stories will now appear in user’s newsfeeds. Facebook says this won’t be nearly as intrusive to their 800+ million members as it sounds. The ads will be marked as “sponsored”, they will be strictly regulated so that users will see no more than 1 ad in their newsfeed per day, and they will only contain content about friends or pages with which the user is already connected. This gives your ad better odds of being seen by those who would be interested in your business – the types of people you want to like your business page. Also, Facebook users can’t opt out of sponsored stories, everyone’s getting them. They can, however, delete individual ads from their newsfeed, but that’s less likely to happen because the ads only show information about friends or pages they already interact with on Facebook. It allows you to get your content front and center on people’s newsfeeds, mixed in with all the organic content generated by people’s friends and page likes. Also, the ‘sponsored’ tag on the lower right hand side of the ad is unlikely to be noticed until after the user has processed the ad. If it’s even noticed at all. It’s a pretty small tag, as you can see from the screenshot below. Another potential benefit for marketers is that this is another way to target Facebook’s 800m+ users, half of which return to the site daily. With sponsored ads appearing in newsfeeds and the right sidebar, as well as traditional Facebook ads, the amount of potential daily impressions for ads will skyrocket. 2. Ad prices could increase because the addition of sponsored stories could increase demand for Facebook ads. Time will tell which one ends up being true. Either way, there’s bound to be the usual protests surrounding any change on Facebook, but we have a feeling that will die down pretty quick. Personally, I don’t mind seeing relevant ads on Facebook, and I don’t think it will make a big difference whether they appear on the right sidebar, or within my newsfeed. Highly targeted ads are nice because they inform me of deals or pages I might not have known about otherwise. However, Facebook will need to be careful about maintaining a good ad to organic content ratio. Sponsored ads would quickly get annoying if they began overtaking the newsfeed. I know I can’t be the only one that would think that way. This article was written by Corrie Scott, a Digital Marketing Manager with Out-Smarts Marketing and a graduate of the Sauder School of Business at the University of British Columbia with an honours degree in Commerce. Her professional interests include marketing, economics, and law, and she has aspirations to pursue a joint MBA-Law degree.